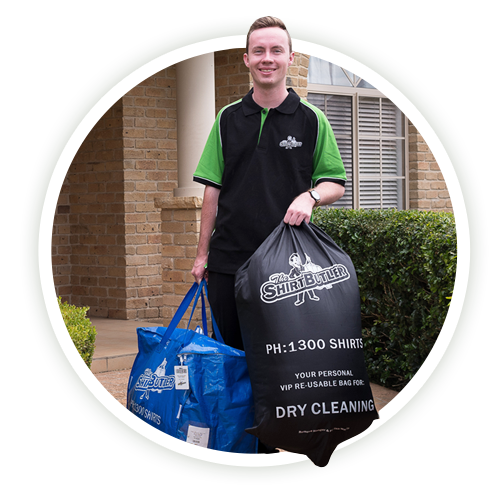 Sydney's #1 Mobile Dry Cleaning, Laundry and Ironing Service. Ultimate convenience for all your laundry needs. We’re focused on simplifying the chore of laundry for our customers. At the touch of a button, your laundry is picked up, cleaned by our trained professionals and brought back to you, meaning laundry time can now be used for the things you’d rather be doing. All of our customers enjoy free pickup and delivery and $20 dollars off your first order. You’ll enjoy complete peace of mind knowing that your garments are tagged so that every item is full tracked from your home, to cleaning and then delivery. Nobody enjoys washing and ironing and everybody can think of better things to do with their time. The difference? Now you actually can! We’ve built a reputation in providing the highest quality in dry cleaning services. Fill out the form and schedule your pickup for the next available pickup day. 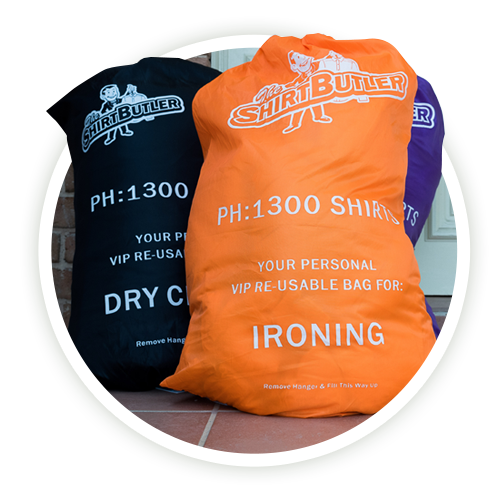 We collect your garments unattended, direct from your chosen location, using our VIP service bags. Our in-house experts clean your garments within 48 hours using sensitive & eco responsible detergents. Each item is quality assured prior to delivery. Our automated item tracking provides full accountability of all your favourite garments. We text/email you on pickup & delivery. Why Choose The Shirt Butler? No more worrying about your minimum order – unlike our competitors we have no minimum order value providing you with a convenient service that allows you to schedule a pickup whenever you need. We use Omo Sensitive for our laundry and there is no use of perchloroethylene in our dry cleaning plant – kind to your skin and safe to the environment. On your first order you’ll receive Individual bag tags, bar codes and garment tags allow for full trackability – ensuring no loss of items and complete peace of mind. Never worry about lost items again with a reliable and quality service you can trust. Don’t waste your time sitting in traffic or trying to find a parking space for a traditional dry cleaner, those days are gone. Save petrol costs, parking fees and precious time and enjoy doing the things you love while you let us do your laundry for you. Do we service locally in McMahons Point? Absolutely – we service this area and surrounding suburbs and will be expanding further in the coming months. If you’re tired of doing your own laundry, or making the switch from traditional dry cleaning, then it’s common to have some questions. Below you’ll find some of our most frequently asked questions and a link to your FAQ page which provides comprehensive answers to any questions you might have. Still confused? Don’t worry, give our friendly team a call today and we’ll discuss any questions you have and we can help you schedule your first pickup to your home in McMahons Point. No. Delivery is part of the service and our drivers have been instructed not to accept tips. I have sensitive skin. Do you offer hypoallergenic detergents? Yes – we use Omo Sensitive laundry detergent on your laundered items. How is your service different from traditional dry cleaners? Most cleaning companies specialise in one thing, either Dry Cleaning or Laundry or Ironing. We are a one-stop garment care business providing all the services you need in one place. We perform Dry Cleaning & Individual Garment Care, Business Shirt Service, Wash & Fold, Wash & Iron, Ironing, Alterations and Repairs. Where possible (and practical) we use a gentler, more environmentally safe cleaning process that leaves your clothes with a fresh scent. Your clothes will be free of the harsh, chemical smell that other dry cleaning processes leave behind. In addition we pick up and deliver for FREE with no minimum order value. I find it a very efficient service that makes my life a lot easier.. Not having to drop off and pick up. I’ve been very happy with The Shirt Butler’s service, quality and pricing. I use them all the time. These guys are amazing. Laundry is picked and dropped off like clockwork. They were a real game changer for me when I returned to work from maternity leave. I wish I could outsource other housework to them. And their customer service is amazing – they have happily offered me out of cycle pick ups and drop offs when I’ve forgotten to put the laundry out in the agreed spot. I wish other local businesses were as helpful!! Just tried these guys as a option, and it was amazing! For what you pay, it’s very fast, affordable, incredibly convenient, reliable and all very personalised and that it really feels like you have a butler! Will def be using these guys again! !